While the “vast majority” of children who stayed in hospital overnight or were seen as a day patient were satisfied with the care they received, hospital stays are failing children with learning disabilities and mental health needs, a major new report by the CQC revealed. In total, almost 19,000 children and young people took part in the survey. Most were happy with the care they received, felt staff did everything possible to control their pain and they understood the information given to them about their hospital visit. However, children with learning disabilities, or mental health needs reported poorer experiences of care than those without. 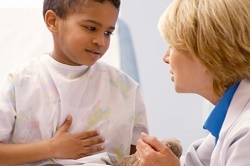 Almost three quarters of children and young people who have had surgery or a procedure received explanations about what had happened in a way that was easy for them to understand. 42% children aged 8-11 said staff did not play or do any activities with them while in hospital. Less than half of parents and carers of children with a physical disability, mental health needs or a learning disability felt that staff definitely knew how to care for their child’s individual needs. This compares to 72% of parents and carers of children without these conditions. Almost two thirds of parents and carers of children with a physical disability, and 68% of those with children with mental health needs or a learning disability, said the ward had appropriate equipment or adaptations suitable for their child, compared with 81% of parents and carers whose children did not have these needs. Commenting on the findings, Professor Edward Baker, CQC’s Deputy Chief Inspector of Hospitals, said: “There is much to celebrate in our first survey to ask children and young people about their care. “Nationally, most young people and children said they were happy with their care, are able to understand the information given by staff following an operation or procedure, and that they have confidence staff are doing everything they can to manage their pain. “However, there is marked variation between the results from individual hospitals. We have now inspected the majority of children’s hospital services in England, and those inspections have also shown marked variation in the quality of care provided. Jolanta Lasota, CEO at Ambitious about Autism said the findings were symptomatic of a wider problem regarding the understanding of special needs: “A hospital experience is traumatic for any child but it is even more so for those with special needs. A good understanding of the nature of learning disabilities such as autism is vital in knowing how to treat someone on the autism spectrum. Factors that might not be taken into consideration for others, such as sensitivity to physical contact, bright lights and loud noise, can all be extra factors that make a hospital experience more traumatic for those with autism.